Access to clean water has been a significant factor in establishing and growing population centers through most of history. Even today, proximity to a water supply is a key contributor to growth and development. Through modern science and technology, we have developed treatment processes that allow us to utilize a wider range of natural water quality to supply local needs. Once the water has been treated, it is subjected to various chemical and physical tests to ensure that it meets requirements for further use. One requirement is that the water is free from harmful pollutants, while others deal with the aesthetic quality of the water. The amount of TS and TDS present in a sample greatly affects the overall palatability of the water and its suitability for use in washing. TS are the materials left in a vessel after a sample is evaporated at a defined temperature. TDS are the portion of the total solids that pass through a 2.0-μm (or smaller) nominal pore-size filter. For TS, the liquid sample is evaporated at a temperature of 104°C; for TDS, the filtrate is first evaporated and the evaporating dish is then transferred to a 180°C oven for at least one hour. In both analyses, the evaporating dish is cooled in a desiccator to temperature of the balance and is then weighed. These heating, cooling and weighing steps are repeated until a constant weight of ±0.5 mg is achieved. 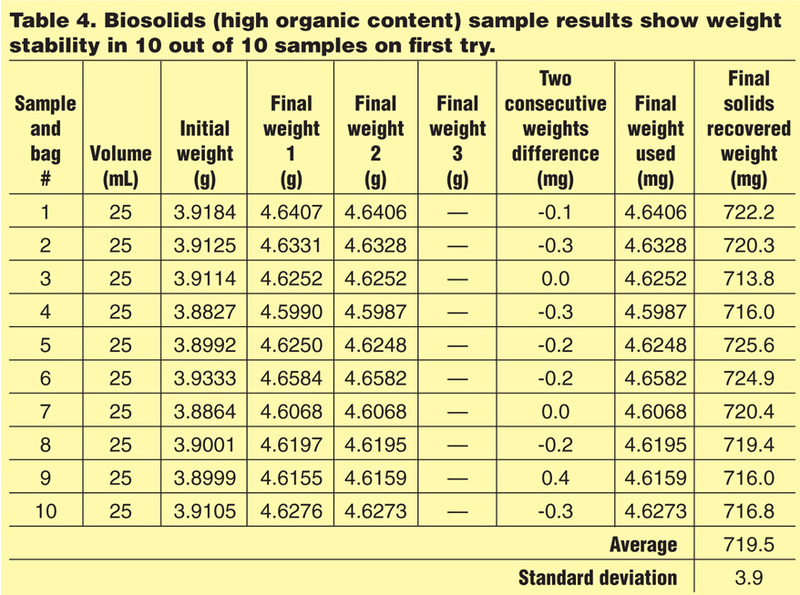 The difference between the post- and pre-weight is the mass of TS or TDS for the sample. The key to successful TS and TDS analysis is the container in which the filtrate is evaporated. 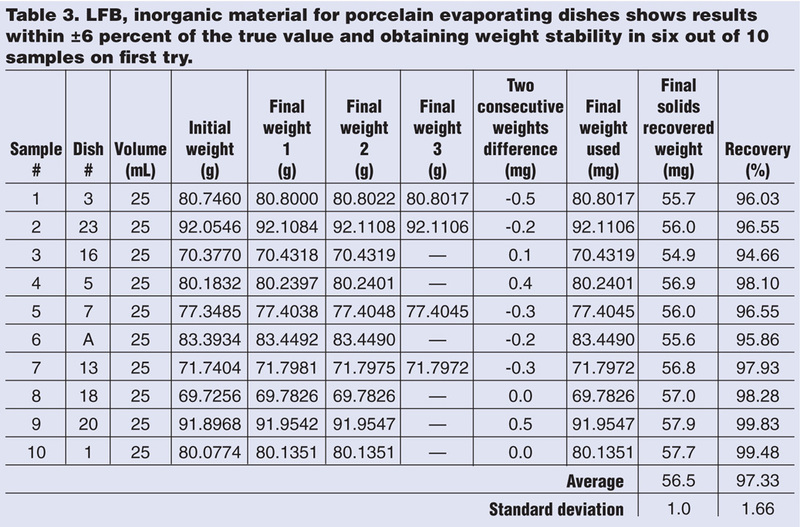 Approved analytical methods (such as Standard Methods 2540B and 2540C) have specific instructions regarding preparation of the container to achieve the most accurate results possible; the evaporation dishes must hold at least 100 mL and be constructed of porcelain, platinum or high-silica glass. The dish must be washed with soapy water to remove residue, rinsed with deionized water and then dried for one hour at 104°C for TS or 180°C for TDS. It should then be stored in a desiccator until ready for use (the dish should be weighed immediately prior to use). The primary reason for these material and preparation requirements is to demonstrate stability of the mass measurements. 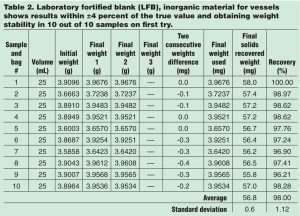 The mass is measured down to 0.1 mg, which leaves little room for variance from any sources outside of the actual drying rate of the residue. 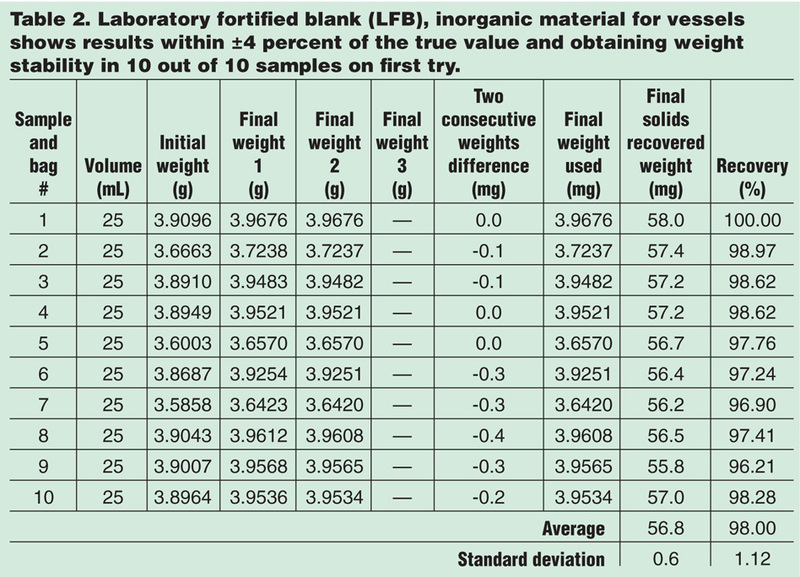 The materials were chosen because they are inert to water and common water-soluble compounds, as well as being stable at the temperatures required during the testing. Traditional dishes used for TS and TDS analysis weigh around 80 grams and the sample residue range per Standard Methods is 2.5 to 200 mg. 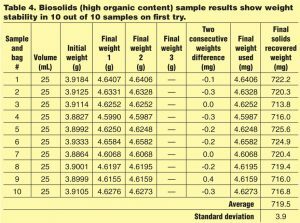 This creates sensitivity issues in the analysis that can lead to erroneous results and difficulties establishing weight stability. A new line of vessels weighs between three and four grams, giving much better resolution on lower TS and TDS ranges, and helping to achieve weight stability faster. One of the most widely used evaporating dishes is the porcelain crucible. 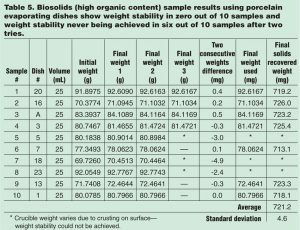 These are shipped to the laboratory with a glaze that helps decrease moisture absorption from the atmosphere, which is important when establishing dish pre-weight and weight stability at the end of analysis. Over time, the glaze wears off from washing the crucibles to remove residue from previous analyses. 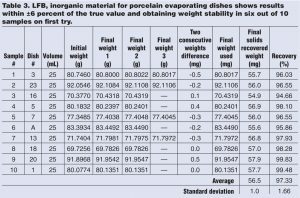 Porcelain is a porous material that draws moisture from the atmosphere, affecting weights. This leads to data uncertainty and adversely affects results. 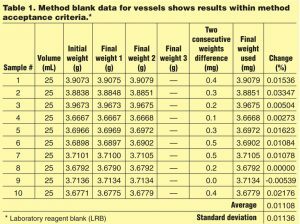 Initial testing of the newer vessels has indicated that it may offer an opportunity to increase the functional range of the test method. As mentioned earlier, the test method limits the amount of dried residue present after evaporation to not exceed 200 mg. The reason behind this is to prevent the formation of a crust as the residue crystallizes out. In high enough concentrations, this crust can form over still liquid portions of the sample. If this happens, it can prevent the full evaporation of the liquid, thus contributing to erroneously high results. Another possibility is that enough vapor pressure will build up under the crust to burst through. In this instance, loss of dried residue or liquid sample may occur, resulting in erroneously low results. The crust forms because the material of the evaporating dish provides an anchoring spot for crystals to form. The vessel incorporates some of the properties of fluoropolymers giving it a measure of ‘non-stickiness.’ This causes crystals to slide down the wall of the vessel as they form and collect on the bottom instead of forming a crust. Such properties need to be further studied to define any upper limit that may exist. Standard Methods for the Examination of Water and Wastewater, 23rd Edition, adds an additional option to the previously accepted materials. 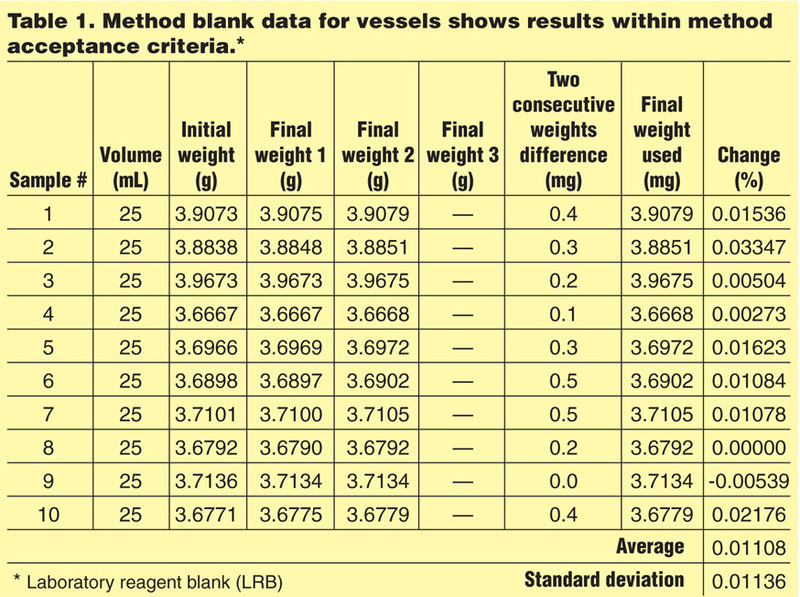 In addition to high-silica glass, porcelain or platinum, laboratories may use “other material shown to be resistant to the sample matrix and weight stable at the required evaporation and drying temperature.” The new vessel mentioned above is included as an example of such material. Standard Methods is currently available in print and online. Joe Boyd is the Business Segment Director at Environmental Express. He has been with the company for nine years and is responsible for product development and manages the technical support staff. Boyd also supports the marketing and sales teams with technical expertise, training and technical writing. He can be reached at joeB@envexp.com. David Smith is the Technical Support Specialist at Environmental Express. He has been with the company for six years and is responsible for product development, technical support of company products and assistance in analytical method problems. Smith has experience in analysis of environmental samples and is familiar with multiple regulatory programs and accrediting bodies. His specialty is environmental wet-chemistry analysis. Smith can be reached at davidS@envexp.com. Environmental Express, a Cole-Parmer company, is a leading developer, manufacturer and distributor of environmental laboratory equipment and consumable supplies for commercial, governmental, industrial and academic laboratories worldwide. The company provides an entire range of laboratory products used in applications such as water/wastewater, oil and grease, metals and hazardous waste analyses. The company prides itself on offering innovative products, superior technical support, knowledgeable customer service and expedited shipping. 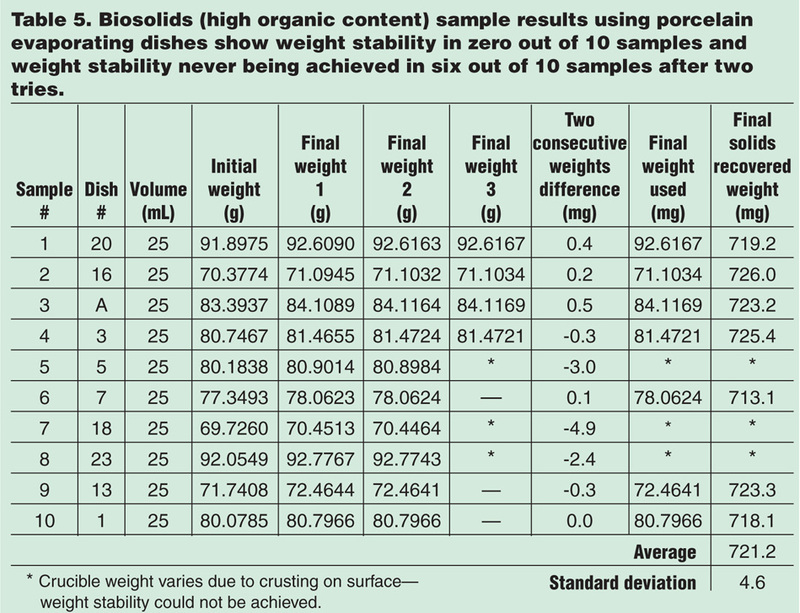 StableWeigh™ vessels are an alternative to traditional evaporation dishes or crucibles. Constructed of a proprietary blend of high-temperature plastics, they arrive at the laboratory as prepared vessels, ready to use for TS or TDS analysis. Each vessel meets the preparation requirements of Standard Methods and is pre-weighed, with the weight and ID printed on the vessel. The disposable vessels are constructed of a proprietary blend of high-temperature plastics that will not absorb moisture from the atmosphere. Unique properties of vessel material and design greatly reduce cooling times.